Printable Updates - As Requested by You! Printable Updates – As Requested by You! It’s a mini hodge-podge of printables today! I debated doing two separate posts for these, but then I thought why not combine them and do an early edition of my Reader Request feature? 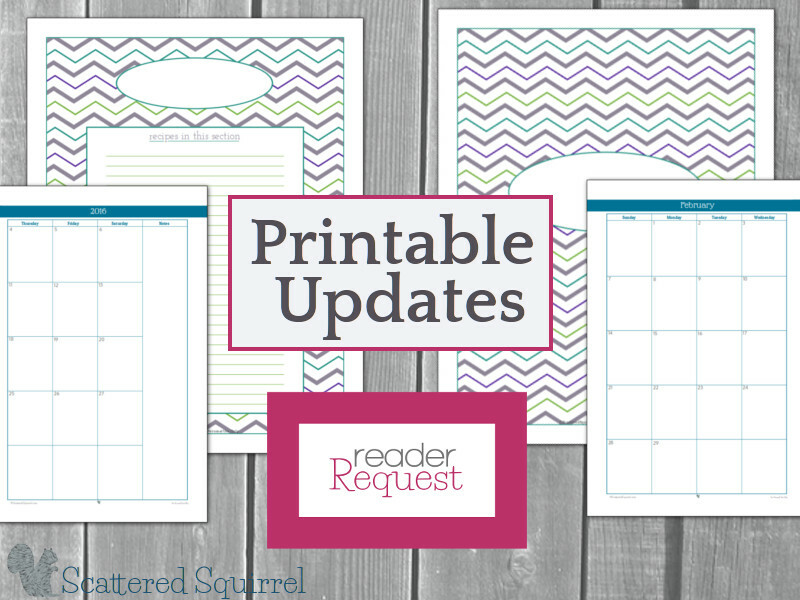 By far, some of the most popular requests are for tweaks or updates to existing printables. I try to group similar ones together as I did for the February Reader Request, but this time it just seemed more prudent to share these three now rather than creating two separate posts for them. So hop on down to check them out. I keep a running list of the requests I receive so that I (hopefully) don’t forget any of them. There are times when I receive similar requests and those items end up with a check mark beside them for each time that a change, update, or printable has been requested. Today, I’m sharing three of the most popular ‘update’ requests I’ve gotten this year so far. Two years ago I took part in my very first 31 Days challenge. We had been living in our new home for just over a year and I was still struggling with figuring out a good way to organize our kitchen so I decided to challenge myself in more ways than one – reorganize the kitchen and use that as my topic for the 31 Days Challenge, and so 31 Days to a Clean and Organized Kitchen was born. As part of that series I set up a kitchen binder and shared all the printables I created here on the blog. 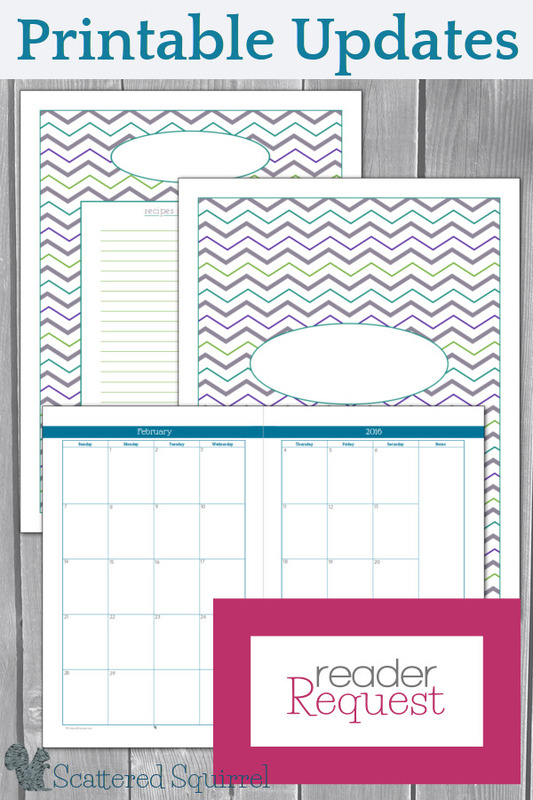 The following two printables are blank versions of the two different dividers that I created. The first one is a blank version of my section dividers. I tried to make sure I thought of sections everyone would want, but forgot that sometimes a blank version is what is needed. Now, these divider cover pages can be used for more than just kitchen binders, which I think is great. This one is a blank version of my recipe section dividers. Everyone has their own way of organizing and categorizing their recipes, and again I overlooked the benefit to having a blank version. This way you can organize your recipes in a way that makes sense to you. The table of contents area has been a huge help for our family, with two of us adding recipes and not always organizing them the same way, having this list at the front of each section makes it really easy to find what we’re looking for without having to search through the whole book. 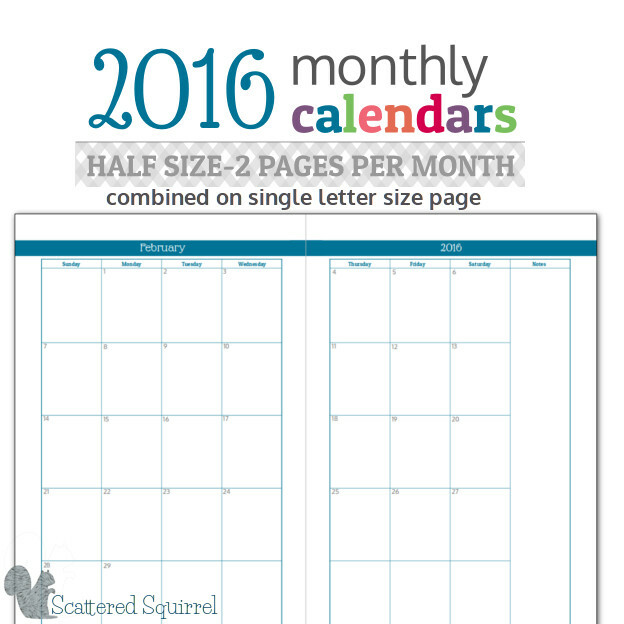 This next printable update is for the 2016 2 page per month, half-size calendar. When I first shared the calendars earlier this year, I mentioned that I had struggled with figuring out the layout for this one in particular because so many of you wanted to be able to print them double-sided. After playing around with it for months, I finally opted to make them as individual pages instead of two pages per sheet of paper. I included instructions for how to print them in the post, but many of you have asked for a version that is the same as I’ve done in previous years, and I’m happy to say that it’s ready for you. Just like the one from 2015, this one prints one month on a US Letter sheet of paper, in Landscape orientation. Just simply print then cut in half and you have two half-size pages. If you have a request for a new printable or for updates to one of my existing one, please let me know in the comments or send me an email. I would love to hear from you. 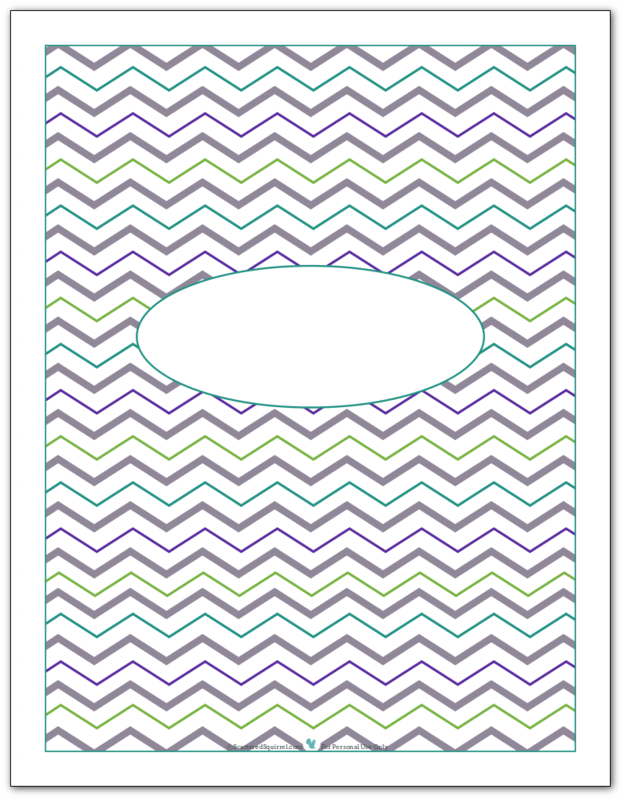 Would you like to see more divider printables (with different backgrounds of course) that you can use for whatever you need them for? At first though “2016 Calendar, that’s so far away!” Then, thinking, “Wait, no, this year is well over half done, and it will be time to plan for next year soon enough”. Crazy how fast time seems to go! Yeah, it is kind of crazy, but I shared the first versions back in April because I kept getting so many emails asking when I’d have them ready. It’s crazy, but I guess for some they need to be able to plan out their following year early. The table of contents part has come in really handy for us, especially since my husband keeps adding more recipes to our binder. It makes it so easy to quickly check what recipes are in each section. Thanks Sheila. I hope they like them. I love being able to tweak, change or even make whole new ones that fill a need for someone. It’s always fun to see how other people use them. I ADORE these updates, and have another possible one for you. 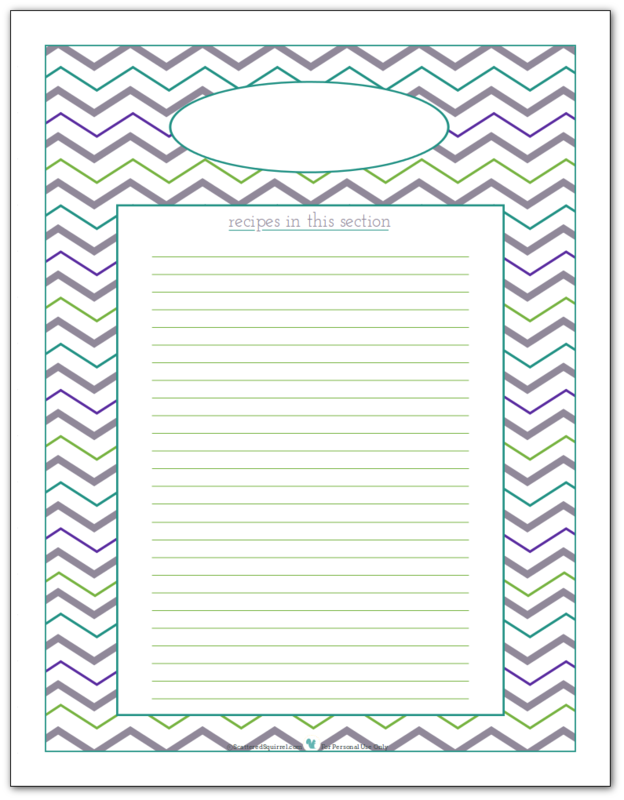 Make all your recipe binder printables available in half (1/2) sheet sizes as well. This would make the binder more easily transportable for those who like to take their recipes with them to the store (to double check ingredients). Thank you so much Lora. I am working on a half-size version of them all, but it’s taking a little time trying to figure out the layout for many of them. I’m hoping to be able to share those all later on this year. Thanks so much for the suggestion, I wouldn’t have thought of taking it to the store, but that makes sooo much sense. You are so creative Ms Squirrel! I love these – and I can’t believe we’re so close to 2016 either, in fact I had to make a 6 month dental check up appt yesterday which of course falls in February so I need to get started on my planner! Awww, thanks so much Clare. It’s crazy how close the end of the year is coming up isn’t it? It still seems so far away, but we’re more than halfway through it. Thank you so much for creating these printables – I used your 2015 2 page for 1/2 size and one I am so glad that you have done it for 2016! I know it takes a lot of work and I really appreciate it. What a gift you have! I’m very very thankful you go out of your way to make these printables. I’m constantly looking for a printable that suits my needs and I think I found it in your daily page with the schedule and to do lists. I’m glad I have so many options to choose from on your website in case my needs change :). By the way, will you be tweeking the colors on the daily/weekly pages to coordinate with the 2016 colors? Love your website, thanks for all of your work!! I used the 2015 2 months per page and was looking for 2016 2 months per page. I fold them in half and put them in a half size sheet protector and keep it in my little notebook. Anyways, will you be making 2 months per page for 2016? Are they here and I just can’t find them? I do have the two months per page ones for 2016 all done, however I made as individual half-size sheets. If you look on my sidebar you will see a picture that say 2016 half-size calendars, click that and you’ll get taken to the right post. When you go to print them, in your printer settings select two per page and make sure your paper orientation is set to portrait. That should print them the right way for you. I’m working on putting them together in the same format (two per page) as the 2015 ones, but I won’t be able to share those until November. If you would rather wait for that. Thank you, Alli, for making these blank versions of kitchen dividers! I can use them to customize my own binder; but I also want to create kitchen binders (or at least recipe books) for each of my kids–as they move away, they can take with them their favorite recipes from growing up. I also want to include recipes from my Mom and grandmothers that became family favorites. So, thank you again! Love you and your site!